which one should I keep if I got 1 of the DS trinkets ? also is my Reforge good or not ? from Bottled Wishes: 381 Spell Power (15 second on-use effect on a 90 second cooldown) and 458 Haste Rating. 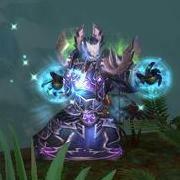 For your Elemental Shaman (as well as for any caster), Intellect is vastly superior to Spell Power, so this makes Foul Gift of the Demon Lord the clear winner (the Mastery and Haste gains are similar in value, so they should not be used to determine the relative values of the trinkets). Regarding Threadlinked Chain and Opal of the Secret Order, you need to understand that, as a DPS caster, you do not get benefits from Spirit in the way healers do (i.e., it does not increase your mana regeneration while in combat). As a DPS caster, your mana regeneration while in combat is equal to 5% of your base mana (about 1171 MP5). Therefore, you need to consider that Spirit and Hit Rating are exactly the same for your Elemental Shaman. So the only factor on which you are going to base your decision is which of the two items provide the best second stat. As you noted, Haste Rating is better than Critical Strike Rating, meaning that Opal of the Secret Order is the better choice. OK so my choice is Foul Gift of the Demon Lord here. Sorry for the late reply, I'm currently moving places, so I quickly glanced at the Shaman forums the other day and I thought you were simply adding a reply to Amajed's question. Therefore, I didn't give it all the attention I should have! The answer is that Bottled Wishes is better than Figurine - Jeweled Serpent. Also, you did right to keep Foul Gift of the Demon Lord with your Will of Unbinding, because it is better than both Bottled Wishes and Figurine - Jeweled Serpent. PS. I hope moving is/was going well. As you can see i got the essenece of brillance in LFR last night replacing the essence of terror trinket i had previosuly from raid finder. this new trinket reduces my spell power by 1000 points and features crit rather than haste. is it really superior to essence of terror? Thanks for your question Ronebean, I'd recommend moving it to a new thread rather than keeping this necro thread alive (it's from T13). Once you've done that, I'll lock this thread. Thread now being locked so we don't necro it again. The new trinkets thread is here. This thread is for comments about our Aggro Shaman Guide.